The most essential element of any academic writing is its corresponding referencing style. It is a set of rules following which the academic writing should be completed. The main purpose of referencing style for any kind of writing is to enlighten the writer about the ways by which his thoughts, ideas and works can be acknowledged in a particular way. It is the key to a good academic writing and assignments and is often considered to be a strenuous task. Research work and assignments done in accordance with a particular referencing style are always ranked high. Undoubtedly referencing is the most essential part of any academic writing and without it any assignment or academic writing is incomplete. The most important thing that a referencing does is that it validates the written piece of the writer. Very often the research and many other academic writings are required to contain certain references failing which they are charged penalties in different forms. It signifies the research and handwork that is done before attempting the assignment. It signifies that the piece of writing is written from authentic resource pages. It also enables the reader to refer to the original sources that have been used before writing and also helps them to trace those original sources. It acts as a documentary support for the given piece of writing and the argument in it. It sometimes signifies that the piece of writing is actually based on official sources and has not been copied from some other individual. There are a number of referencing styles that are followed by different universities as every university and every department has its own preferred referencing style. The Harvard referencing style is used by many students of many universities for citing the informational sources. 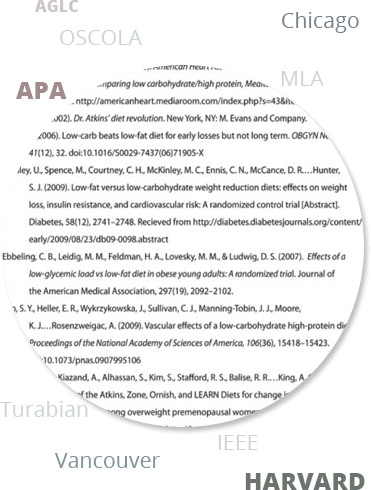 It uses two kinds of citations in its referencing system. The in-text kind of citations is used while paraphrasing or quoting a source directly in Harvard style referencing. These are located inside the work's body and contain the Citation's full fragment. APA is the abbreviated form of American psychological association. This form of referencing style is used extensively in social studies academic writing and is used for the purpose of citing sources. This citation guide of APA is well revised in accordance with the 6th edition of APA manual. This provides a general format for reference pages and in-text citations. MLA is the abbreviated form of Modern language association and is very commonly used for the purpose of writing papers and citing sources in the humanities as well as the liberal arts field. This resource is updated basically in order to reflect MLA handbooks. These citations provides with the examples of the general formats of research papers, footnotes, in text citations and the cited page of works. The Chicago style referencing is a quick guide which [presents two main kinds of documentation systems one of which constitutes the name and bibliography and the other one consists of the author date. The writer has to choose between the two documentation systems and this basically depends on the subject matter and the cited source's nature. This type of referencing system is a numbered referencing style and is used the science and medicine fields. It consists of citation to somebody else's work in the form of the text, which is indicated by using number system. It consists of a sequentially numbered reference list which provides all details of the text reference at the end of the document. OSCOLA is the abbreviated form of Oxford University Standard for Citation of Legal Authorities. It is designed in order to provide the authors help in order to achieve a consistency in their work. This particular referencing system is used by the Oxford University Commonwealth Law Journal and also, the authors of the general have been proved significant for the development of the journal. This particular referencing system is used commonly throughout the world for the purpose of attribution of the credits to the authors whose facts, theories or findings have been contributed to some research paper or journal. It consists of a numbered referencing system at the end of the research paper or the journal in order to provide information about the sources used by the authors. This particular referencing style is for the authors that write thesis, dissertation and research papers specifically. It consists two basic documentation styles, one being the notes-bibliography and the other being the author-data style. The bibliography style is used extensively in the fields of literature, history and the arts. The author-data style is very commonly termed as the reference list style. AGLC is the abbreviated form of Australian guide to legal citation and is a footnoting style. The footnote numbers are placed after the punctuation marks and are present at the end of each and every page of the given document. This system makes use of a full stop after each and every footnote. It includes the references in the form of pinpoints. Below are some of the responses from the students who have taken our help. Being a newbie in this uni I had a lot of difficulty in following the referencing pattern. Thanks! To NeedAssignmentHelp for doing my assignment according to the referencing pattern for me. Last time I got a bad grade in my assignment just because of poor referencing, but this time NeedAssignmentHelp nailed it and I got an A+ in my assignments. While completing my course work I was confused between the APA and the Harvard referencing system, but thanks to NAH for providing solutions for my confusions. My university follows the Harvard referencing system and I had no clue about what exactly it is. I referred to NAH for getting help and they assisted me in the right way. Thanks a ton! I have been a good student and always completed my assignments on time, but got lesser grades due to improper referencing. Thank you! NAH I got an A just because of your referencing help. I never understood the concept of Chicago referencing until NeedAssignmentHelp assisted me in the right way. Thank you pals! I am a bond in referencing now. Being an Australian student I was asked to follow the AGLC referencing system but I personally had no clear vision of it. NAH guided me and hence, I scored a very high grade. Thanks pals! Following referencing style of the university is important failing which the university has all the rights to deduct marks. Thanks NAH for providing the best referencing help to me. My teacher is very fussy when it comes to the referencing style of the coursework. Thanks to NAH for providing the referencing style help, now my teacher is always happy from me. Most of the students find it difficult in following a certain specific referencing pattern of a particular university. The reasons for this can be a change in university or the country or simply lack of understanding. Assignments and homework having reference styles that differ from the University's referencing system may lead to deduction of marks from the student's assignments and can affect the grade points of student adversely. The highly qualified and skilled experts at NeedAssignmentHelp have a complete understanding as well as knowledge of the referencing styles followed by different universities. Our professionals are PhD scholars and have all the necessary information about the concerned subject matter and the referencing styles of the university. NeedAssignmentHelp provides assignment, essay, coursework and every other kind of academic help to the students. Our main motive is to eliminate the burden of assignments from students. The assignments or the essay done by the experts are free from plagiarism and are 100 % authentic. Our experts keep in mind the referencing styles used in different universities all over the globe and hence, provide the most appropriate and error free assignments and homework. The services of NeedAssignmentHelp are affordable and are available in 8 different countries. If you to wish to achieve the highest grades in your class then you should definitely refer to the NeedAssignmentHelp portal. Students from many countries have been using it for getting their assignments done and have been passing their grades with flying colours. "The service which I got from Need Assignment Help was just excellent. I was quite scared regarding my assignment submission because it was very close, but NAH helped me out in the best way. Just in 24..."